I LOVE this look!! You are absolutely gorgeous! Thank you so much for your videos and inspiration!! I LOVE YOU KANDEE!!! i showed my mom your vids. and now shes hooked and is in there everyday trying on new looks! wow simple ... but you rock!! Hey! I was wondering if you can replicate Shakira's look in her new video she wolf i think she looks incredible please make a tutorial on that look! your beautiful btw! 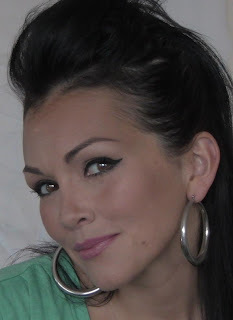 Kandee, I have to say that I just LOOOVE your videos and I love you too! I've just found you on youtube and I've been watching all your videos for the last couple days. They're just increadible! Loved the make up tips. I live in Brazil so it's kinda hard to find some of the products you recommend, but I'm trying to import them. I'd like to ask you for a make up advice for my sister's wedding. She's getting married next September 5th and the cerimony will be held in country house during the day (at 1p.m. )and I'm the bridesmaid. I have no idea of what kind of make up I'm going to use. My dress is gonna be cream color with some delicate details in light green. Can I use smoked eyes or this is too much? Pleeasee help me! I wish you success! First i wana say you are such a GReAT and STrong women and i admire you.And secondly i wanted to know where you go to order the Dermanew system u where using? i don't know if u can reply to me but u can hit me real fast on my email if u can get the time dgodinez_ghs@yahoo.com THANKS!!!!! !